Want a lightbox for tracing? These are the best on the market right now. Remember when you were at school and you had to use special paper to trace images? Well, a lightbox allows you to do the same, only onto normal paper. 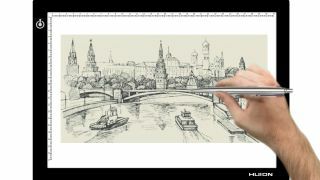 For that reason, lightboxes are used widely by artists, illustrators, designers and architects in the course of their work; for instance, for copying a rough sketch on scrap onto professional drawing paper. They're also useful for other tasks such as scrapbooking, viewing slides and photo negatives, tattoo design, calligraphy, quilting and so on. How does a lightbox work? A lightbox is quite a simple device. It's basically a square or rectangular container with a glass or plexiglass surface, and a light shining beneath it. You switch the light box on, place the image you want to copy on the glass, place your paper on top, and the light should enable you to see your image clearly enough to trace it. Depending on the thickness of paper, you may have to dim the lights in your studio; the darker you make the room, the easier the image will be to see on the lightbox. Also note that while these devices are called ‘lightboxes’, they're not big, chunky and box-like. Most are indeed very sleek and thin, so they’re also often called ‘light tables’ or – more accurately still – ‘light pads’ as they’re similar in size and shape to a notepad, or indeed an iPad. In this post, we’ve gathered together the the best lightboxes for tracing that represent the best value on the market today. They all offer a high level of transparency, and adjustable levels of brightness, to help with both accuracy and eye strain. So the choice between them will mainly come down to specifics like the size of working surface you need, how lightweight and portable you need the device to be, and how strong you need the light to be. The overall best lightbox for tracing, in our view, is the Yaufey LED A3 Light Box, which is the first on our list. That’s because it’s an extremely reliable and solid performer, offers a good range of brightness levels, a great brightness control system, a generous work surface area, and an excellent bag of extras. However, other models of lightbox may be more suited to your specific needs, so we’ve also included five other on our list, each of which has a unique selling point. Yaufey’s lightbox is our overall favourite, for a number of reasons. For a start, it’s both super-slim, and large enough to comfortably work with paper sizes up to A3. We also like that it provides 10 pre-set levels of brightness, which you toggle through simply by pressing the power switch, up to a pretty intense 5200 Lux. There’s also an added 'intelligent memory' feature that will automatically switch to the brightness level you used previously, each time you switch it on. It’s not the cheapest model, admittedly, but you do get a few extras for your money. On the back are four non-slip mats on the back to make the lightbox more stable in use, plus the light pad comes with two bags, 20 sheets of tracing paper, a pair of gloves, and two clips to fix your paper in place. And while many lightboxes on the market only come with a USB charging cable, with this one you’ll get an adapter plug too. The only potential downside is that it’s the heaviest model on our list, at 1.2kg, so if portability is your main concern, you might want to opt for a lighter alternative. But otherwise, this is a solid and professional light pad that’s more than capable of meeting your tracing needs. A much smaller and lighter model than Yaufley’s (above), Huion’s L4S Light Pad is a great choice if you want a device you can easily carry everywhere. Like the former, it offers adjustable levels of brightness via the power button and a brightness memory function. The level of brightness it offers, at 1100 lux, is the lowest on our list, but it’s still sufficient for most tracing purposes. Although the L4S is cheaper than the Yaufley, it still comes with a few extras: namely, six sheets of tracing Paper, a 2m-long USB cable (though not an adapter), an adjustable stand, a bulldog clip to fix your papers in place, and a microfibre cleaning cloth. The main downside is the working area, which at just 8.2 x 12.2 inches (210 x 310mm) is the smallest among the models featured here. But that’s an obvious corollary of this model’s excellent portability, so if the latter is important to you, that may be a compromise you’re willing to live with. If the L4S made you think Huion only did small lightboxes, then this model will quickly disabuse you of that notion. As its name makes clear, this model – Huion Super Large and Slim LED Light Box – offers a very generous working area of 20.5 x 12.6 inches, the largest on our list. It’s also super-thin, at just 0.28 inches (7.3mm) in thickness, and comes with a 6.56-feet long cable and plug, so it can be powered directly from a wall socket. Unlike other models, you adjust the brightness not in ‘steps’, but in a more sensitive and graduated way, to allow you to arrive at a more precise result that suits your eyes and tracing needs best. You do this by holding down the power button, and although this can be tricky to get used to at first, you’ll soon get the hang of it. There’s also a brightness memory function. Overall, this is a high-quality, solidly constructed model that’s not only lightweight and slimline (making it easy to transport and store) but most crucially, offers a superior-sized active surface. So if you want a generous amount of workspace for your tracing, it comes highly recommended. Artograph’s lightbox is significantly more expensive than its rivals on this list. But if money is no object, it can offer something the others don’t: a (fully adjustable) range of brightness from a dim 500 lux to a sunglasses-bothering 9000 lux. That’s going to make your tracing a heck of a lot easier, especially if you’re working with heavier weights of paper, or even fabric. The model looks pretty darned swish too, with an extruded aluminium frame and chrome steel corners that are both beautifully sleek and physically durable. With a decent working area of 12 x 9 inches, it comes bundled with a protective storage sleeve and power supply. There’s also a dedicated storage bag, sold separately, which is very cleverly designed and well worth investigating. In short, this light box doesn't come cheap, but with its good looks and that superior 9000 lux of brightness, you are getting what you pay for. Looking for something that’s cheap and cheerful, which just gets the job done? Then we’ll recommend the LitEnergy A4 Tracing Light Box, which offers excellent value. This model provides brightness up to a very decent 4000 lux. It’s fully adjustable: keep pressing the touch switch for several seconds until you get the desired level you want. And there’s a smart memory function too. It comes with a USB cable (although no adapter) and user manual, and the company offers an impressive 360-days warranty and hassle-free return policy. And that’s basically it: there’s nothing particular special or different about this model. But it does the job it’s tasked with well, and for such a low price, what more could you ask for? This model from Zecti really stretches the definition of ‘box’: at just 0.15in (4mm) thick, it’s a truly wafer-thin device that makes it very convenient for both carrying and storing. It also has something else unique about it: the retainer clip is fixed on the drawing board, which could save you a lot of time if you tend to misplace clips easily. On the downside, this does raise the lightbox off your desk a little, which could be a concern if you tend to press down hard with your pencil or pen, as this could potentially warp the edges of the device. Other than that issue, this is a good, solid performer that comes in at a very affordale price. With six levels of adjustable brightness than increase each time you press the power button, this lightbox also comes with a USB cable (though no adapter), a user manual, and an 18-month warranty.